We are returning to Ecuador with a hummingbird-focused tour to the high Andes, the true “hummingbird capital of the world”. Expect to see over 40 species of hummingbirds while enjoying world-class accommodations and birding. Six to eight participants will accompany Tom Wood and Sheri Williamson (author of the Peterson Field Guide to Hummingbirds) and a local guide as we explore both slopes of the Andes and a variety of habitats. Our tours are low-key relaxed trips with plenty of time to watch the feeders at our lodges, photograph the myriad of hummingbirds and tanagers or simply enjoy the Ecuadorian hospitality. 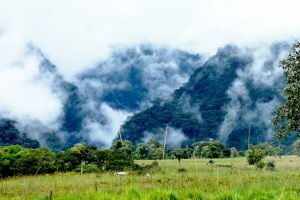 After a night in Quito, we will visit the Mindo area on the western cordillera of the Andes probably the best-known hummingbird hotspot in the world. Along with hummingbirds we will also see an astounding array of colorful tanagers, motmots, toucans and other tropical birds. We will visit Angel Paz’s famous farm to see and meet the famous pittas that share his farm. Returning to Quito, we will then head east to the high mountain pass of the Andes, home of the Giant, Hummingbird, Andean Condor, and Andean Hillstar. The high lodges here host different hummers than the western ones and include the incredible Sword-billed Hummingbird and the charming Wire-crested Thorntail. We will visit 4 different lodges with feeding stations on the east slope, each with their own signature birds. The trip is designed to see a high diversity of hummingbirds, but as anyone who has travelled with us will tell you, we enjoy everything along the way. Our trips are perfect for someone just wanting to enjoy a trip to this wonderful region, relax and see some birds. We use playback sparingly and only when appropriate. If there is enough interest, we may add a 3-night, 4 day Amazon trip extension for those interested. Day 1 .- arrival to Quito and transfer to Puembo Bird Garden . Day 7 Birding around the Cayambe Coca, after lunch visit Guango Lodge. Drive to San Isidro. Day 10 drive to Quito, day use and then international flight.